For March we are offering our Dehydrated Meals in a bucket. The cut off date for this order is April 1st. So send in your orders and checks to take advantage of these great meals. If you would like to get a sample of one of the meals please stop by at 14575 Daneway Dr., Frisco, TX and you can pick one one or email us with your address and we can get you a quote for shipping and handling (about $5 give or take) and we will mail you one. The buckets contain disaster preparedness food packs that are designed to fulfill individual or family disaster and emergency preparedness food storage needs by presenting a variety of current dehydrated food products to provide for long-term storage food. The emergency food is packaged and sealed into 5-gallon pails. These pails are flushed with nitrogen gas and oxygen-absorbing packets that are added immediately prior to sealing to greatly extend shelf life. The shelf life of the disaster preparedness food unopened with the original seal is 25 years and we suggest a “best if used by” date of 2 years after the seal of the pail is broken. The food is packaged in a convenient family-size presentation, that delivers 5 servings of survival food per package for rice dishes, and approximately 12.5 servings for the vegetable and lentil soup foods. 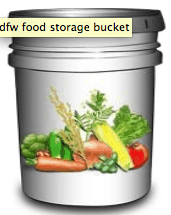 We offer a variety of preparedness food items in each pail. Most retail food storage companies charge around $2/serving for dehydrated food. These are highest of high quality food storage items for the lowest possible price. Servings start at just $.24 each. Plus they taste great. Since we know this is a concern for food storage, contact us if you would like a sample to see for yourself.